Last June, my wife, kids and I were back in Los Angeles. 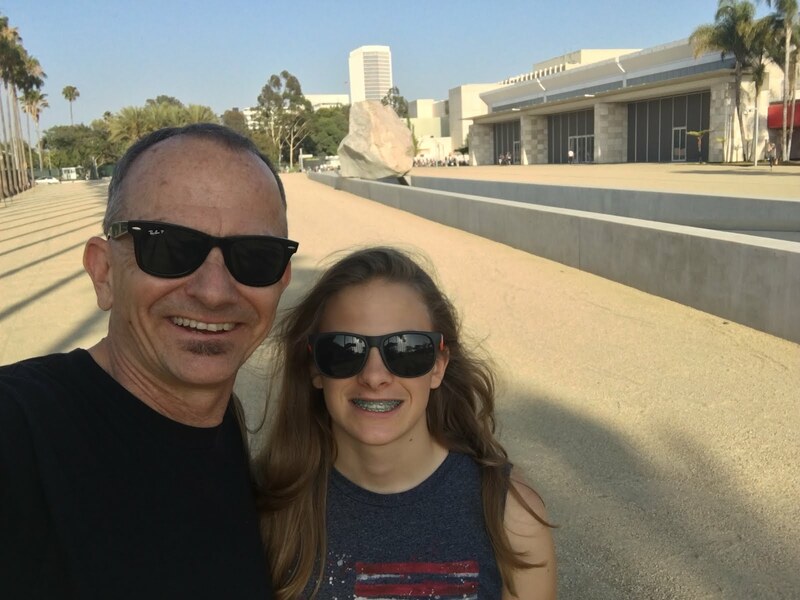 We took a little extra time to see the sights, including what our kids remember from our time living in L.A. Above, is the world famous La Brea Tar Pits, located in the Miracle Mile district of midtown Los Angeles. 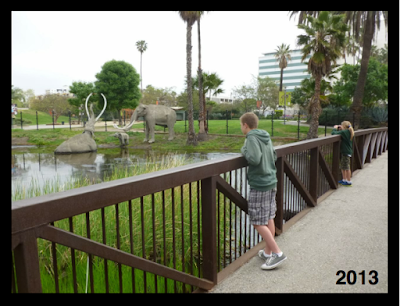 The La Brea Tar Pits contains the largest collection of ice age fossils in the world. Incredibly, it's in the heart of a huge city - literally along Wilshire Blvd. Los Angeles voters just approved funding to cover the cost of extending the Purple Line Subway along Wilshire all the way to UCLA, meaning the subway coming within feet of these massive tar pits. Wow. What looks like a pond is really an inch or less of water trapped on the surface of the tar pit. Prehistoric animals - including Mammoths, similar to these large fiberglass models - would come get trapped in search of water, sinking into the tar. Our kids remembering going here when we lived in L.A. - and seeing it on a short family vacation during Spring Break 2013. Methane bubbles continue to surface as you look out across the tar pit. It's really incredible and worth stopping and seeing. The Page Museum is located on the grounds, featuring displays and and hundreds of ice age animal skeletons. The Page offers a free day the first Tuesday of every month (except July and August). Plus it's free every Tuesday during the month of September. Here's a link to their website. Right next door is Chris Burden's Urban Light, the outdoor sculpture outside of the LACMA (Los Angeles County Museum of Art). 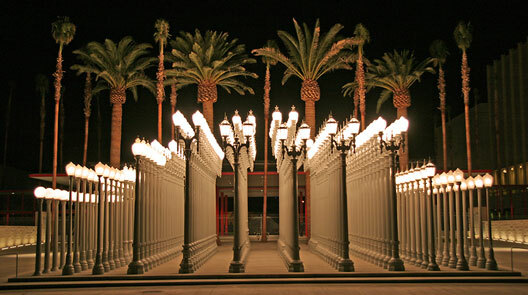 LACMA offers a free day the second Tuesday of every month, but you can walk around this impressive display of historic street lights any time free of charge. They also offer a free day the last Saturday of January (here's a link to when my son and I took advantage of this last January). .... but incredible at night! I highly recommend trying to see it if you're in Los Angeles. Here's a link from a much earlier post, back in 2009, with some photos and thoughts on Urban Light. 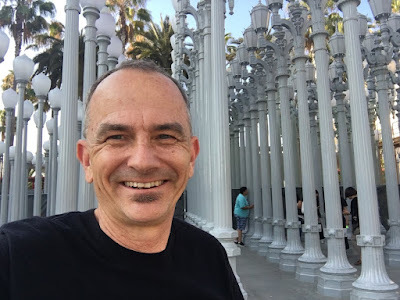 Interestingly, this has ended up being the most popular post here on ExperiencingLA.com. Across the street is the Petersen Automotive Museum, with it's new decorative exterior. We've been in the past, here's a link to a previous visit of what's inside. 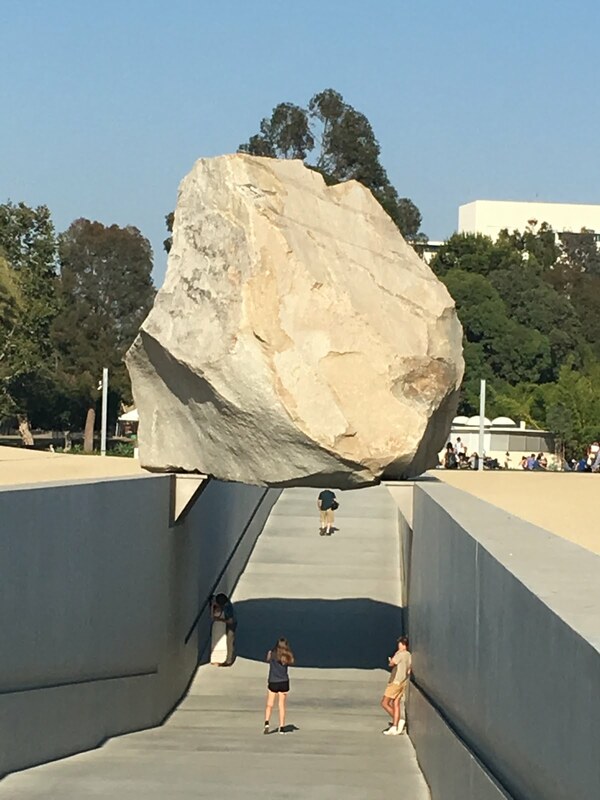 My kids really wanted revisit Levitated Mass, the "floating" 340 ton boulder located on the LACMA grounds. It cost $10 million dollars - all from private donations. While it's no Statue of Liberty (New York) or Cloudgate (Chicago) - it's slowly grown on me. To paraphrase another blogger: "Some folks pay millions of dollars for a diamond the size of a marble! I say L.A. got more show for the dough!" Located to the left of where my daughter is standing is the future home of the privately funded Academy Museum of Motion Pictures, scheduled to open in 2018. THAT will certainly be a game changer to an already dynamic part of the city. Like Urban Light, Levitated Mass is public art that's free to walk around an enjoy. In addition, across the street from the La Brea Tar Pits on Wilshire Blvd, is The Wall on Wilshire, the largest section of the Berlin Wall outside of Germany. A final - and different - view of Levitated Mass. Here's a link to a previous family visit at this same spot. As we headed to our car, I noticed a large crowd out for a free summer event on the grass. In addition, the Original Farmer's Market and The Grove are just three blocks away. Lots of stuff going on in this part of Los Angeles. 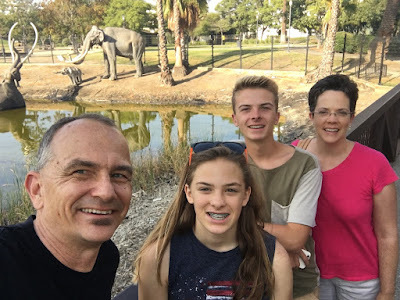 Lots of other cool stuff to experience in Los Angeles - but our family had plans to spend the next day south of L.A. at Disneyland. More on that next time.